The superhero genre has been going strong for several years now and I’ve been wondering when was it going to run out of steam. At what point was the quality of the films going to suffer leading audiences to say enough is enough? In 2005 Christopher Nolan made a great contribution to the genre with “Batman Begins”. 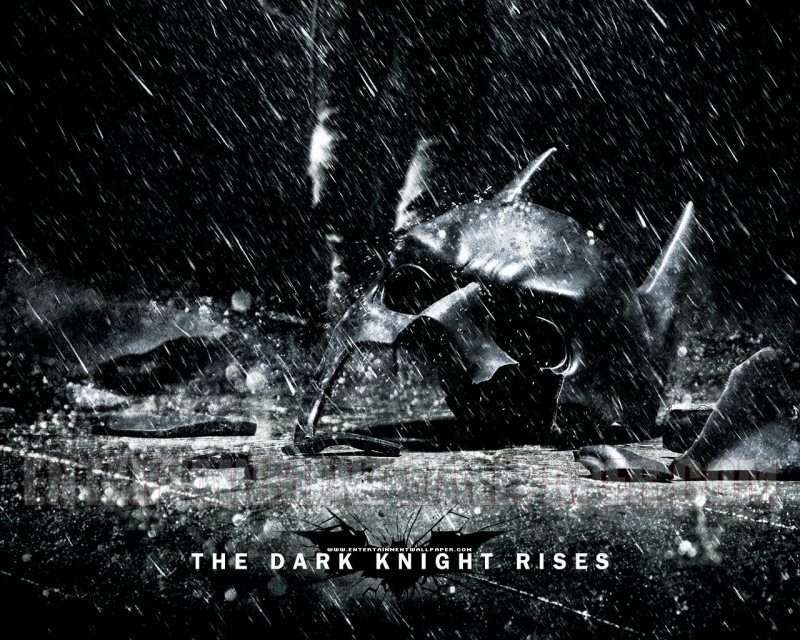 He followed it up with 2008′ s phenomenal “The Dark Knight”, a film that was not only one of the best sequels ever made but a demonstrative statement showing that superhero films can be legitimate and powerful forms of cinematic entertainment. That brings us to “The Dark Knight Rises” the final film of Christopher Nolan’s Batman run and the end of what could easily go down as one of the best movie trilogies in motion picture history. “The Dark Knight Rises” is smart, layered, gritty, moving, and action-packed. Nolan not only wraps up his series in a competent and satisfying way, he gives us one of the most potent and energetic movie experiences you’ll find – a near perfect mix of comic book action, socially reflective drama, and expert storytelling. If these are the kinds of films we could get regularly from the superhero genre, I see no limit to their lifespans. 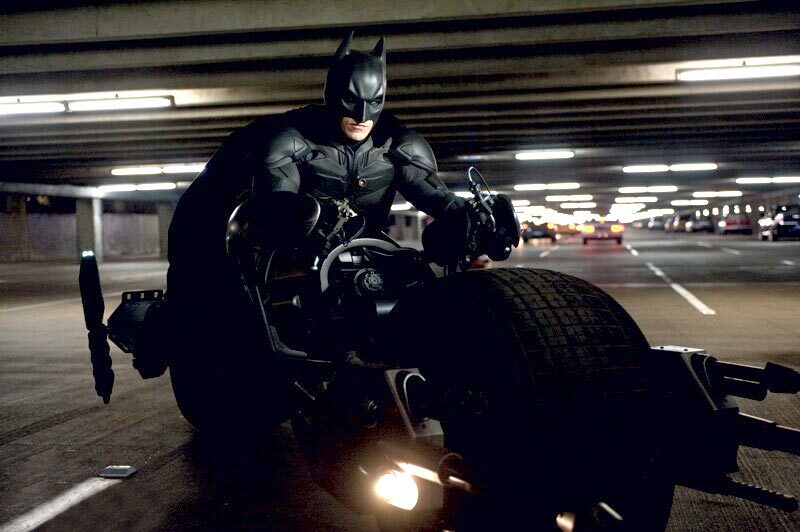 This film takes place 8 years after Batman rode off into the shadows at the end of “The Dark Knight”. Batman is a fugitive, unjustly but willingly, wanted for the murder of Harvey Dent. There have been no Batman sightings during this time and crime in Gotham City has declined due to an inspired city leadership and law enforcement armed with the Dent Act. Bruce Wayne (Christian Bale) has become a hobbled recluse, spending all of his time in a closed off wing of Wayne Manor where long-time family friend and faithful butler Alfred (Michael Caine) is his only contact with the outside world. Gotham has become lethargic in its approach to crime and peace time has made the city leaders careless. Everyone except commissioner Jim Gordon (Gary Oldman) and Officer Blake (Joseph Gordon-Levitt), a devoted young patrolman. With their guard down, the city is hit head-on by a brutal but calculated terrorist named Bane (Tom Hardy). Bane’s destructive assault on Gotham cripples the city and as all-out anarchy takes hold, the need for Batman is greater than ever. Morgan Freeman also returns as Lucius Fox, Bruce Wayne’s close friend and acting president of Wayne Enterprises. Fox is struggling to keep the company afloat following the poor position Bruce left him in. In addition to Hardy and Gordon-Levitt, Anne Hathaway joins the series as Selina Kyle, a cat burglar who steals out of Robin Hood-like motivations but also with a single more direct purpose in mind. Also new to the cast is Marion Cotillard. She plays Miranda Tate, a Wayne Enterprises board member and philanthropist with a great interest in green energy technology and Wayne’s investments into it. Matthew Modine plays Deputy Peter Foley, a spineless officer who is more interested in making a name for himself by catching Batman than stopping the coming storm at the hands of Bane. We also get Ben Mendelsohn as a slimy self-serving Wayne board member with his hands in deeper in than they should be. Nolan takes this amazing collection of acting talent and throws them all into his smorgasbord of plot lines and dramatic twists. But he never loses control of the film and everything comes together in an extremely satisfying way. Nolan incorporates several relevent and current issues into the story, none more prevalent than the entire class warfare theme. Selina has a very anti-rich people mindset seeing the wealthy as a key cause to society’s ills. 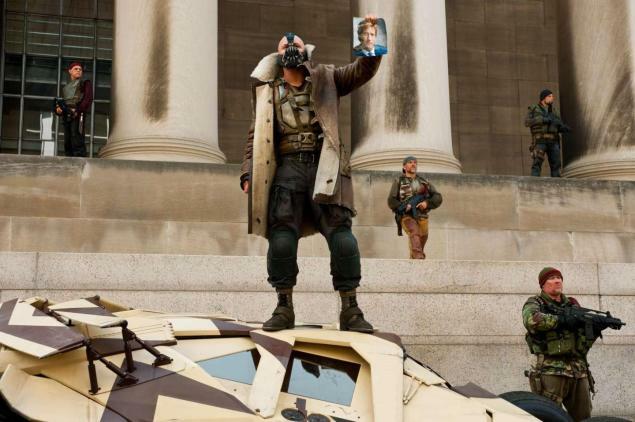 Bane himself seeks to take the power out of the hands of the wealthy, the local government, and law enforcement and give it to the poor and downtrodden. But Nolan doesn’t sugarcoat or promote anything. In fact he shows where an extreme and unbridled class warfare position can lead. Some may say that his presentation is heavy-handed but I felt it worked perfectly in the greater context of the story. Nolan and his brother Jonathan wrote the screenplay and even with the heavy exposition in the first 30 minutes – clearly intended to fill the audience in on what has transpired during the missing 8 years – the movie moves at a crisp and fluid pace. As with all of Nolan’s pictures, there are layers of story that unfold to reveal deeper meanings and cool dramatic twists that should please both comic book fanboys and lovers of good storytelling. He doesn’t dumb things down nor does he ever patronize the audience. The film sets the table for us then causes us to attentively hang on for dear life – a most pleasing challenge. Much like “The Dark Knight” there are no shortcuts here. The film isn’t just a loud summer studio comic book adaptation. It’s brilliant cinematic storytelling that takes a superhero concept, laces it with a true sense of reality, and presents it to us in a beautifully crafted package. Another example of why Christopher Nolan is one of our best directors and visual storytellers. I’ve mentioned the cast but they deserve more than just a few words. Bale IS Batman and this is his strongest work of the entire series. We see him as a broken and vulnerable man as well as the growling caped crusader. Bale has no problems relaying either to the audience. Anne Hathaway is also very good as Catwoman (even though she’s never called Catwoman) and while I wasn’t certain she completely belonged in Nolan’s more realistic Batman universe, he never overdoes the character and Hathaway sells her well. Tom Hardy will undoubtedly face comparisons to Heath Ledger’s Joker from the last film but that’s terrible unfair. 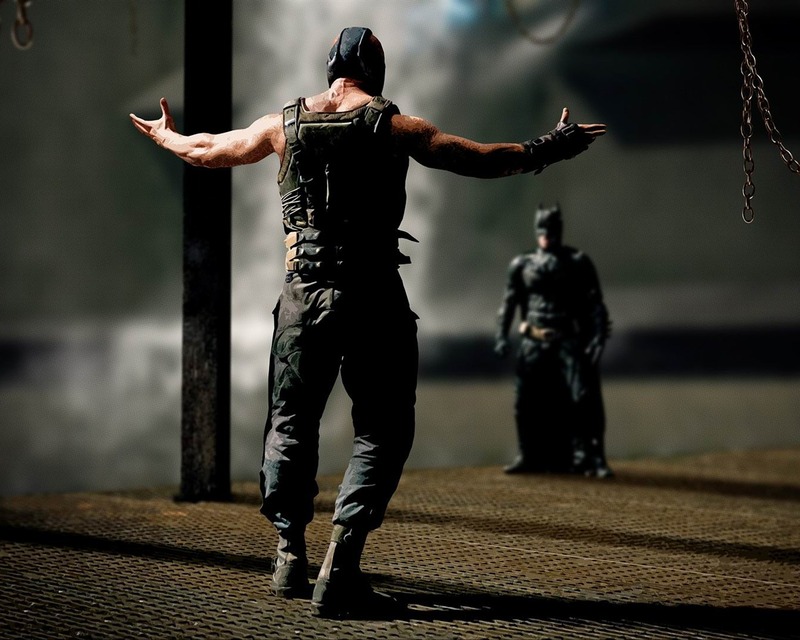 The two villains couldn’t be more different and Hardy’s Bane easily stands on his own. Hardy spends the entire film behind a mask but his body language and brute swagger makes him a most menacing villain. Gary Oldman is fantastic as always as was the lovely Marion Cotillard. Michael Caine is wonderful and has some of the best exchanges with Bale. Unfortunately he disappears in the second half of the film. And Joseph Gordon-Levitt continues to prove he is a solid young actor. Perhaps the only weak spot was with Matthew Modine who I never really bought into. His character only adds one small thing to the story and Modine never makes him all that compelling or interesting. Technically “The Dark Knight Rises” is the jaw-dropper I expected it to be. Nolan’s stylistic flare and incredible camera work do a great job of capturing the panic and dread of a city under siege. The special effects are stunning and the action sequences are big and boisterous. Nolan gives us some new Batman toys as well as some old favorites and they’re used in several cool crowd-pleasing ways. I also loved the fight choreography. You know by the trailer that there is going to be a Bane and Batman showdown and Nolan builds it up with undeniable intensity. Then when the payoff comes, we aren’t hampered by herky-jerky camera movements. Instead Nolan lets the fights take place without any fancy gimmicks. It was incredibly satisfying. I also loved Hans Zimmer’s score. Some have voiced dislike for his ever-present pounding music but it worked for me. I felt it contributed to the intensity that the film is going for just as Zimmer’s scores have done for the previous two Batman movies. “The Dark Knight Rises” once again plunges the people of Gotham and us into the depths of fear and dread while examining evil and the darker side of society. Yet the film always allows us hope. This is certainly another dark story but the stakes are high and the ending is exceptional and rewarding and the perfect goodbye to a phenomenal trilogy. I wanted to stand and applaud. The film stretches the boundaries of the comic book genre. It’s large in scale, full of story, and absolutely engrossing throughout it’s almost 3 hour running time. “The Dark Knight Rises” is far more than simply great. It’s a modern classic featuring mesmerizing performances, fist-pumping action, and genuine intelligence. It’s a visual spectacle. It’s emotionally and intellectually stimulating. It’s a text book lesson on the melding of big budget flamboyance with smart and challenging storytelling. It’s hard to accept that this is Nolan’s final Batman film but he has given us a gift – a groundbreaking series of films capped by a truly glorious finale. What a ride it’s been and what a way to end it. This entry was posted in Movie Reviews - D and tagged anne hathaway, batman, christian bale, christopher nolan, dark knight, dc comics, gary oldman, joseph gordon-levitt, liam neeson, marion cotillard, matthew modine, michael caine, morgan freeman, tom hardy. Bookmark the permalink. Thanks Kristen! Did I sound a little giddy!!! I really responded to the movie and I can’t wait to see it again! In fact, I hope to see it at the IMAX next Friday! It was a great movie! It could easily stand alone without having to watch the previous two. Nolan has done a fantastic job of creating Bruce/Batman and staying as true to the comic book history as possible. The villians have all been wonderful! He has done a great job telling Bruce’s story, his internal conflict. The casting has been incredible. The trilogy will go down in history as a complement to the DC Universe! Thanks man! I absolutely loved it. Hope to see in on IMAX Friday! While I enjoyed this third installment, I would place it in a solid third place with regards to the Nolan Batman films. I found the film lacking in action and humor, with the exception of Hathaway everyone seemed stuck on dour for the films duration. I was not sold on Bane, his mush mouthed dialogue was hard to understand and while I appreciated his raw strength, his character lacked the gravitas of the previous villains in this series. Nolan did bring his A game for the last ten minutes and wrapped things up nicely. However, at least for me the journey to get to that point was lacking the greatness I have come to expect from Nolan/Batman. While I loved Batman Begins, I really liked this installment better. Personally I loved Bane. I like that Nolan didn’t just try and make another Joker styled villain. I thought Hardy really sold the brute beast but calculation of Bane. I also loved how the film tied into the last film in a way that the first two really didn’t. For me it was an awesome mix of emotional punches and rousing action. A popcorn summer flick with intelligence. It really worked for me. Nice review. I too thought that Bale did his best work in this movie. Anne was great as Selina as well. Hathaway really surprised me. She was great and Nolan wrote her character perfectly for his world. Thanks a lot for checking out the review! Will do. Thanks for checking mine out.